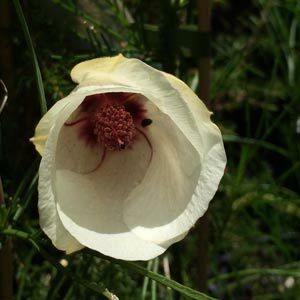 Another plant that is sometimes called a native hibiscus, Alyogyne hakeifolia with its very narrow foliage comes in a number of colours including mauve, yellow and a creamy white. It is the foliage rather than the flowers that readily distinguish the plant from other species. This is a desert plant that grows in harsh conditions across the Nullabor Plain. It has adapted to the heat and lack of water by developing needle like foliage and will survive very long dry periods. A medium sized shrub reaching around 3m in height about the the only things that affect its growth are poorly drained soils and frosts. A well drained soil and a sunny position is essential for Alyogyne hakeifolia . It will grow in part shade, however flowering may be inhibited. Alyogyne hakeifolia is best planted in a position where it receives good air circulation and is not subject to humidity. You can prune Alyogyne hakeifolia after flowering, and this is recommended as it it promotes a bushier plant and more flowers the next season. This is a plant that requires a dry climate. Protection from very strong winds will also improve flowering. It is essential to use a low phosphorus fertiliser on this plant. This is a species where seeds seem to germinate fairly successfully. Propagation from cuttings is also relatively easy. Height – Reaches around 2 metres in height. Spread – Will form a bush around 2 metres across. Flowers – Hibiscus like, pink through to pale lemon yellow. Frost tolerant – Alyogyne hakeifolia will tolerate light frosts. A number of named cultivars are available from specialist including. A.hakeifolia ‘Elle Maree’- This a variety with creamy yellow flowers. A.hakeifolia ‘Shelby Anne’ – Purple flowers. A.hakeifolia ‘Melissa Anne’ – Mauve flowers.